A “fun guy” once told me that mushrooms deserve more than the occasional appearance on a veggie pizza. Ranging in taste from meaty to fruity, mushrooms have endless cooking possibilities. And, better yet, they also have a whole host of associated health benefits. You may have heard that common mushrooms, including buttons and portobellos, contain natural carcinogenic toxins that require them to be cooked prior to consumption. But there’s good news: There are many varieties of mushrooms which have equally strong anti-cancer properties. Other healing powers of mushrooms include lowering cholesterol, boosting the immune system, controlling blood pressure and reducing inflammation, just to name a few. However, if you’ve ever purchased exotic varieties at a specialty grocery store or market you’re probably familiar with their high price. But there’s more good news! 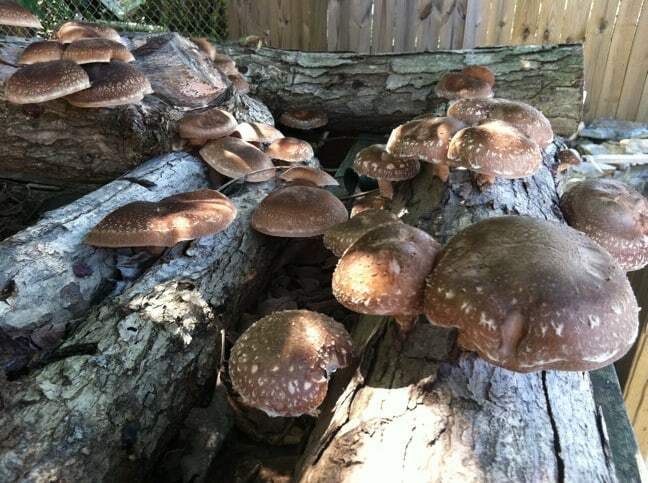 With a log and less than $10 worth of spores, you can create your very own mushroom farm. 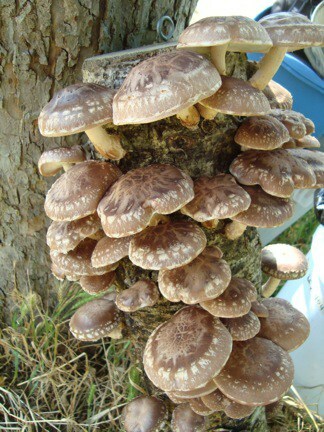 Shiitake and oyster are the most common log-cultivated mushroom varieties and make great first-time growing projects the whole family will love. You’ll be drilling approximately a hundred holes around the log, spaced about 8” apart with 2” between offset rows. Drill each hole just over an inch deep, with enough space for the spore-ridden dowel to fit inside. Hammer one into each hole, making them flesh with the log. Using a brush and melted wax, cover each plug well to keep the spores in and contaminates out. Lean the log against a fence or other structure in your yard, ensuring it’s in a shady location that receives protection from the wind. If the log isn’t exposed to enough moisture or is receiving too much sunlight, you may cover it with a tarp. It should also be watered whenever it feels dry.